If you’ve spent a lot of time trying to level up on your favorite smartphone game, you’re not alone. Gaming apps are the most popular entertainment apps around, with a larger following than music, movie, or sports apps, according to the Nielsen research group. More than three-quarters of entertainment app users played at least one game in the last quarter of 2014, and time spent on mobile gaming is on the rise. If you’re seeking a new game to satisfy your addiction, look to these top Android arcade games. 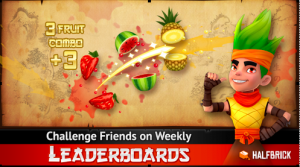 Fruit Ninja began as an instant iPhone classic in April, 2010. An Android release before the end of that year ensured the world’s largest smartphone market could join in the fun. It might be a few years old now, but Fruit Ninja’s proving to be as addictive as ever. It’s such an impressive game that it’s even helped rehabilitate stroke victims! You’ll unleash your inner samurai as you try to slice through fruit while strategically avoiding the bombs. Since the premise is so simple, the game’s easy to pick up. However, you’ll soon learn that mastering it isn’t so easy! 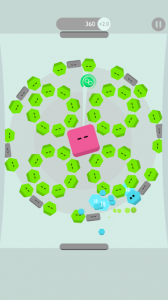 If those bombs are getting you down, play without them in the hypnotic Zen mode. There is a free version of Fruit Ninja as well as an ad-free version costing 99 cents. 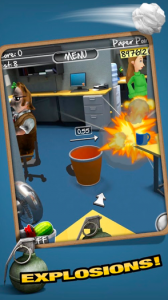 Everyone’s favorite office game has gone digital with the Paper Toss 2.0 app. Just like the original Paper Toss, this game sees you tossing virtual paper into a trash can as you try to outwit the desk fan that emits a gust powerful enough to throw you off your game. But there are a few extras in version 2.0, including new gameplay locations, more objects, and other special features. Some of the new settings include a seedy-looking warehouse, an airport terminal, and the boss’s office, complete with a sleeping boss. Along with the trusty scrunched-up paper ball, you can toss pieces of food, household objects, and even grenades into the trash. The intern level, where an intern on a sliding chair carries the trash can, adds an extra challenge. Paper Toss 2.0 is free to download. Seal Force sees you taking charge of three seal commandos working together to defeat the evil Krillian. 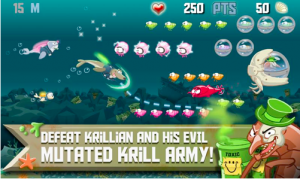 As Fonzie, Sarge, and Milo, you will clear the seas of krill infected by the evil Krillian’s nasty neon-colored virus, Plato. Each seal has special abilities that you’ll need to utilize over 11 challenging levels. Seal Force is as addictive as any arcade game, but unlike so many on the Google Play store, this game is also really beautiful. Its graphics call to mind the popular Saturday morning cartoons of the ’80s and ’90s, with plenty of detail and vibrant colors. It’s best appreciated on a large phone with a high-definition screen, like the Samsung Galaxy S 6 Edge. Seal Force is free to download. Children of the ’80s will fondly remember playing brick-breaking arcade games like Arkanoid and Breakout. Now Noodlecake Studios has brought the genre back with its 2015 app Brickies. And just like the retro arcade games that came before it, Brickies is totally addictive. Here, you control not one but two paddles on the top and bottom of the screen to bounce a ball against the bricks and break them. Power-ups are another modern touch that makes Brickies feel more dynamic than the brick-breaking games of the past. The three-star rating system seen in other popular games like Candy Crush and Angry Birds gives Brickies a similar addictive feel, encouraging players to play and replay levels until they achieve those coveted three stars. And with more than 100 levels, Brickies should keep you feeling challenged for a long time to come. 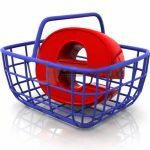 Brickies is free to download. With these addictive arcade games loaded onto your Android phone, there’s no excuse for boredom setting in.